Perhaps I should have qualified my comment and said “mainstream German beer is suffering”, but the warning that I was trying to send covers the good stuff too. The warning is that if German consumers don't look beyond their locals and favourites and their cosy assumptions of greatness, the multinationals will grab more and more. Then they will gradually do what multinationals always do, which is to dumb things down for the sake of profit and dominate via marketing not quality. I certainly wasn't trying to say there are no good beers in Germany – there are lots (just as there were still real ales in Britain in 1971). Most are only available on draught in their home region, as is typically the case with Kölsch and Alt for example, although if you are lucky you will also find some of them in bottles further afield. There are also lots of local breweries and brewpubs – and many thanks to Renate for pointing me at Die Freien Brauer, which for British readers is a society for independent family brewers, rather like Britain's SIBA, and then again to this article from Der Spiegel, about new microbreweries in Berlin (only in German – but Google Translate makes a decent fist of it). There are welcome signs too that some of the regionals and the newer breweries are trying to differentiate themselves – offering their Pils cloudy and unfiltered (a form of Kellerbier) say, or adding a dark Pils, or reinventing older styles such as Zwickl and dark lager. 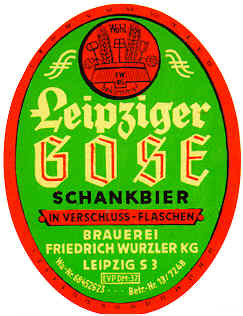 Some have added extra seasonals as well, such as Maibock or Frühlingsbock (Easter bock), and a few have revived once-extinct styles such as Gose sour ale, in Leipzig. German beer as a whole has been left behind though, and certainly isn't the best in the world now, if it ever was. Quite often, what a regional brewery or a brewpub produces is the regulation Pils and/or Weizen, plus maybe one or two others. And even that isn't what most people drink, especially outside Bavaria – that's the produce of the big boys, the Oettingers, Krombachers and Bitburgers, the mass-produced, crisp yet one-dimensional beers. The entire membership of the DFB brews less beer than Oettinger, for example. And it's the “little green bottles from Prussia” slagged off by the author of this article from Süddeutsche Zeitung (again, in German – and GIYF). He also slates the sameyness of the big beers, along with brewery ties and marketing that limit choice on the bar, and the lack of imagination that leads to beer being drunk to get drunk rather than for enjoyment. All this is why Germany needs a beer consumers group – to educate people about how wonderful German beer can be if it's made right, and support those brewers that are doing it right. Sure, the newspapers will do a bit of this every once in a while, but a consumers group can take it to the next level. The other reason why Germany needs a beer consumers group is to ensure that the government doesn't just hear the voices of the big brewing businesses. Sure, organisations such as Die Freien Brauer can do some of this, but they could do a lot more with the backing of a genuine grassroots consumer group. So, how about it – what needs doing, and who ought to be doing it?